Self-Cling Vinyl for mark-free use inside windows. 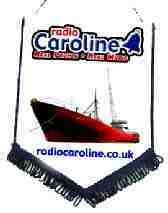 Radio Caroline ‘Ross Revenge’ chef`s apron. 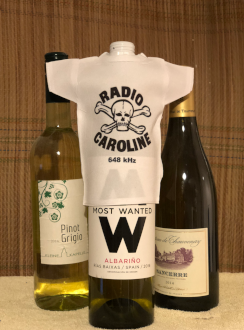 Printed on the bib of the apron with a picture of the Ross Revenge with her new central broadcast tower. This finally replaced the temporary ones erected at sea in 1988 after the orignal record breaking tower was lost, weakened by the notorious 1987 storms. This ivory coloured poly cotton fabric apron comes with a handy pocket and anti-tangle ties. Show off in your kitchen or to dinner guests AND help the Ross Revenge preservation and restoration project. Final Design subject to individual printing to ensure best quality. All mock up images for information only and final products do vary slightly in manufacture. Made individually these Caroline desk clocks will look good in any room or on your desk. 19cm square gloss black finish to stand and clock back. Final Design subject to individual printing of your clock face to ensure best quality. A computer mouse mat featuring the Ross Revenge in Tilbury docks, where she is currently being preserved and restored by our team of volunteers. Size is 230 x 190 x 6 mm fabric topped to suit optical mice. 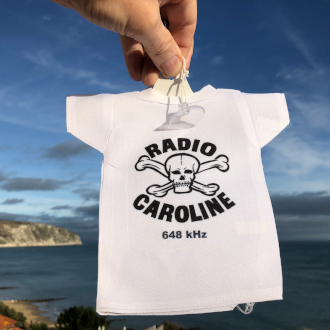 Radio Caroline`s Ross Revenge features on this 25 x 18 cm pennant to help spread the word that Caroline is still with us. Image is approximate. Items will be made to order to best suit the product for you. 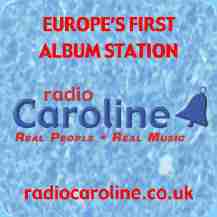 Radio Caroline ‘Curvy’ ball point pens Printed on one side with station logo and the other with slogan and web address. We’ve bundled these in packs of four, due to high postage costs from here in the UK for single items. £5 for pack of two wristbands . 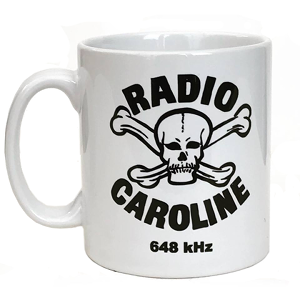 White mug with black Skull & Crossbones 648 kHz log to front and web site address to back. See here for matching T-shirts. 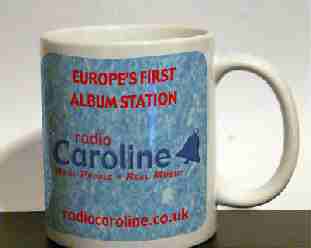 Further mug varieties here and at the bottom of this page (for historical reasons). Photo of a physical sticker under non-ideal lighting. Actual stickers look much better! 6 inch x 7 inch. 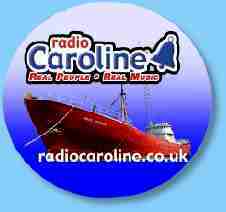 Radio Caroline’s Album station mugs, 90 x 90 mm coasters and 58 x 58 mm fridge magnets to match! The mugs are dishwasher safe for easy cleaning!